I recently came into a nice bit of money (thanks to scalped tickets and this year’s tax return) and instead of being a responsible adult and putting it in my savings account or towards paying off one of my credit cards or student loans, I used it to cure my latest bout of wanderlust. Being responsible and prudent is so boring, don’t you think? Traveling, eating and using accumulated vacation days is so much more fun! And so Flaneur and I planned a little trip south of the border, to Mexico, where several people I know (including my perpetually wrong parents) told me I shouldn’t go. Something about drug wars, kidnappings and mass graves. But we went and came back and had an amazing time in between so all turned out well. We spent a great week lounging on beaches, deepening our tans (or just mine actually, since Flaneur insisted on wearing spf 500), exploring small towns and Mayan ruins, and of course stuffing our faces with delicious and most-of-the-time-ridiculously-cheap Mexican food. See? So much better than debt repayment. In the next few posts I’ll recap some of the awesome stuff we ate and the cool places we ate it in. For now, enjoy the above picture of the crazy delicious ceviche I ate within the first hour of being in Cancun, the home base of our trip. It was from one of the restaurants at the Westin Resort where we stayed, so by far not the most authentic or the cheapest eats we had, but still really good. Every bit as bright, colorful and refreshing in taste as it was in appearance, it was a pretty good start to what would be a a fantastic week in Mexico. 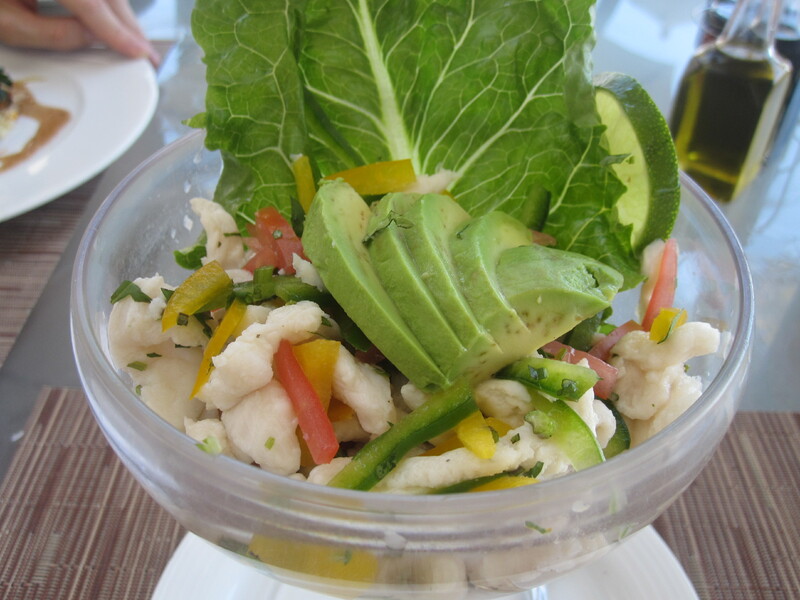 This entry was posted in Lunch and tagged avocado, Cancun, ceviche, Mexico, Westin. Bookmark the permalink.